Wizkid cancels tour due to poor health – Royal Times of Nigeria. 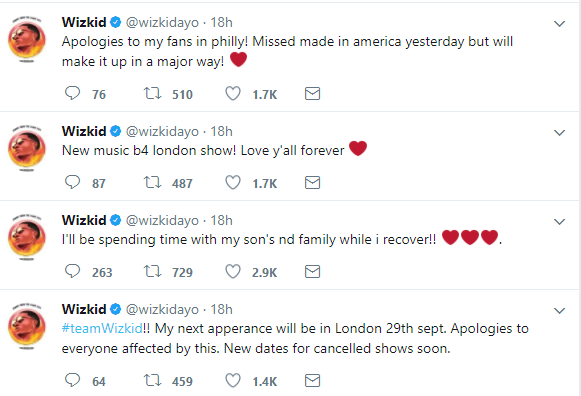 It was a blow for Wizkid’s fans yesterday as the Starboy shared a series of tweets announcing he’d be moving his tour dates and cancelling others due to ill health. Wizkid who was billed to perform at the Budweiser Made in America festival in Philadelphia alongside Tiwa Savage apologised for not making it there as well. It could be recalled that the singer cancelled a Lagos concert that was scheduled to hold in December 2016 for the same reasons too.